Whom do not recognize cassava? Crop "public people" this can be told hardly liked by Indonesia public. Not merely its(the corm having taste that is typical, but cassava leaf also can be jiggered to become a real scrumptious vegetable. Cassava corm has calorie content, protein, fat, charcoal hydrate, calcium, phosphorus, ferrum, vitamin B and C, and amilum. Cassava leaf contains vitamin A, B1 and C, calcium, calorie, phosphorus, protein, fat, charcoal hydrate, and ferrum. Whereas bar skin, contains tannin, peroxidase enzyme, glycoside, and calcium oxalate. 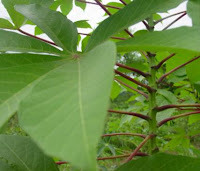 Besides as food, cassava crop has various special qualities as drug. Among others rheumatism drug, headache, fever, hurt, diarrhea, wormy, dysentery, xeropthalmia, gives, and can increase stamina. can be done with usage in and external usage. At external usage,counted 5 cassava leaf sheet, 15 red ginger grams, and lime putty sufficiently, refined and added water sufficiently. After swirled, ingredient dabbed at part of ill body. At usage in, 100 cassava bar grams, 1 leaf sirih, and 15 ginger grams is braised with 1000 cc water so remains 400 cc. Then, filtered and water in drinking 200 cc. Does twice one day. Cassava leaf is boxed then applied for compress. As fever drug, 60 cassava tree trunk grams, 30 caryopsis grams has been soaked is finite softness is braised with 800 cc water so remains 400 cc. Ingredient filtered and drink it’s the water 200 cc. Does twice one day. fresh cassava bar is boxed then glued at part of ill body. cassava is grated then glued at ill part and band. cassava is grated then is extorted. Its(the water is hushed a few moments finite there are sediment of its(the extract, then its(the extract dabbed at wounded part. 7 cassava leaf sheet fed is braised with 800 cc water so remains 400 cc. Then is filtered and in drinking its(the water 200 cc. Does twice one day. 60 cassava bar skin grams and 30 leaf grams ketepeng cina is braised with 600 cc water so remains 300 cc. Then is filtered and drinked it’s the water nearing sleep. Overcomes gives, 200 cassava leaf grams eaten as fresh vegetable. 100 cassava grams, 25 gram koempheria galangal (kencur) and 5 item angco which has thrown it’s the seed, refined by adding water sufficiently. Then added honey and in drinking.